This will be my official wip thread that we'll keep running until the [some]day I get version 5 ready. The track at Alleghany has changed a little. I was recently reading how the pusher steam engines disconnected and prepared to return to Hinton and found out that little team track beside the tool sheds was once a run-around. That made great sense so I re-engineered that area a little. There is also now a full cross-over at Alleghany like in the old days, as well as a full x-over west of Alleghany tunnel. I think this will allow more prototypical steamer operations at the mountaintop. I've been trying to find a line between the 1964 and 1984 maps of this subdivision, so the more I learn, the more it evolves. What I wonder now is what steam-driving players are doing for a water refill at Alleghany? I have conflicting information about exactly where and how that was done and I have a technical issue with implementing a water station there. The siding markers for a FUEL stop would interfere with placing long markers on the main siding for other scenarios. I could put a fuel stop and marker on the mainline but that's awkward and not proto (I think?). Btw, whadaya think of the new (old) signal heads? The light colors on these heads are perfect. I had some trouble coordinating the large 3-heads with the C&O masts we made previously, but I hope folks will find my modeling passable. It's been quite a while since I did some Beta testing for you, Tori gal, but I have always been impressed by how stunning your modelling work is. This new "stuff" looks fantastic. Wish I still had the C&O Alleghany, but somehow the update to TS2013 removed it. I presume there won't be double stacks on this route, or I would worry about the height of the lowest signal head. Otherwise, those look great! I can't wait for the release of your route. And, I must say, it's very nice to finally see you back here again. Thanks Chris. I still have you on my beta-test list (you've been warned, lol). I'm trying to keep the bottom of the signals the same as the tunnel height; hi-boxes and fridges clear them. Although, being reminded of piggybacks and looking at that Ronceverte bridge again I think I will go triple-check some things. I appreciate people pointing out things like this; in an 85-mile route over years of building some things tend to get lost or forgotten. I have Allegheny beta 5 still installed and running. Snagged it up way back when I had the chance. Also still have 4.5. If there is anything I can maybe help you with, just ask. Letting you know. Oh yeah... I've seen that model before.... Forgot about it. Who makes it again? 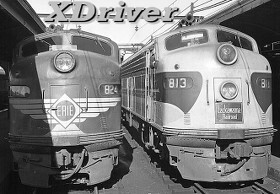 I guess I was thinking too much about what's real and what's not, but a fictional ES44 in Chessie for Railworks would be cool! BTW Tori, more screenshots please!!! Toripony wrote: This will be my official wip thread that we'll keep running until the [some]day I get version 5 ready. Tori, regarding the water sprouts at Alleghany, one could assume there was one at E Alleghany, near Lewis Tunnel, to supply the road engines on EB coal drags that stopped there to drop the pusher and to turn up retainers. A second sprout could be at the turntable lead, to supply the pusher before it returned to Hinton. I'll research my COHS material, or ask the COHS. As to the signals, they are now part of the RCAP, but apparently the source 3D models weren't handed over. So more and better prototypical C&O signals cannot be created new at the moment. In the meantime, I have hacked the aspects and moved the signal heads closer together, to get a better fit. Mind you, the signals should be to the right of the track they govern. In my copy of the beta I have redone the whole route, added number boards to the permissive intermediates, and some more changes to the scripting to comply with C&O signaling rules. It is probably wisest to ask the RCAP to provide the specific signals you'll need. Edwin, I read somewhere -- I think it was "Alleghany with an A" (which I cannot find at the moment) -- about the water pump and storage tank located east of the road overpass which I modeled in the 4.5 route. There is an old photo somewhere of the tank somewhere. Personally, I once saw the "pumphouse" structure down by the creek, but I don't think the tank existed in my lifetime (or was hidden by overgrowth). So, I kind of assumed the spout would be in the same area but I never considered that it could have been plumbed to other spots in the area. Thanks for the suggestions; I'll see if those placements will work. I think your hack might help my 3-head problem. AND, I see you have a GREEN light in the lower position on the head... how'd you do that?! Toripony wrote: Edwin, I read somewhere -- I think it was "Alleghany with an A" (which I cannot find at the moment) -- about the water pump and storage tank located east of the road overpass which I modeled in the 4.5 route. There is an old photo somewhere of the tank somewhere. Personally, I once saw the "pumphouse" structure down by the creek, but I don't think the tank existed in my lifetime (or was hidden by overgrowth). So, I kind of assumed the spout would be in the same area but I never considered that it could have been plumbed to other spots in the area. Thanks for the suggestions; I'll see if those placements will work. I checked my copy of "Alleghany with an A" and on page 9 is a1940 photo with a water column between the WB main and siding on the west (Alleghany) side of the station. This seems the most logical location, as stopped westbounds on the main and in the siding could take water. On page 20 is a photo with a water column between the EB main and siding on the east (East Alleghany) end of the station. Again, the most logical location. The water tank is up the hill where you modeled it, and the pumphouse is below it by the creek across the tracks. Do you want to model the caboose set out track on the east bound siding also? These were probably still in use with first generation Diesels, 50-70 ton coal cars with retainers and cabooses, say till the mid 60's? I'll look over the signals, and ask RCAP for help again. The Bauer 3D source files are also lost, so perhaps new platforms and poles will have to be made to get a proper cantilever signal. I had a nice-looking roundhouse setup in Hinton and just realized that I can't turn the Kanawha (Berk repaint) on the 30M turntable I have installed there (and Ronceverte and Alleghany). Could have sworn that used to work; it's close; maybe I'm just not getting it exactly centered??? So, in anticipation of someday having a 2-8-8-2 Allegheny, I tried the Big Boy turntable. It's a little big for the space, but worse, I had to sacrifice the GN Roundhouse Kit that looks SO good there because I couldn't get the exits to line up. The Siegen roundhouse sort of works but it's skewed plus the stalls are way too short. Besides, I don't like it. Are there any other roundhouses that will fit the BB turntable? I'm sticking to my guns on only using freeware, but sometimes the compromises are difficult... do I leave the setup that fits and looks good but has very limited opportunities to use or do the crappy-looking arrangement with a great turntable that will turn anything we have but leaves half the loco sticking out in the weather? Yea, I know... learn to model my own, right? Not gonna happen. I think I'll take a little break. I made it work by bending a few tracks. This pic is just for you. Hmmm... maybe that's it... drop some of the stalls. Proto for Hinton is 17 stalls; I hadn't considered compromising on that part. But, there's not as much room here to bend the tracks. Hinton was a *really* cramped yard. I've already dropped a couple of tracks to make things fit.